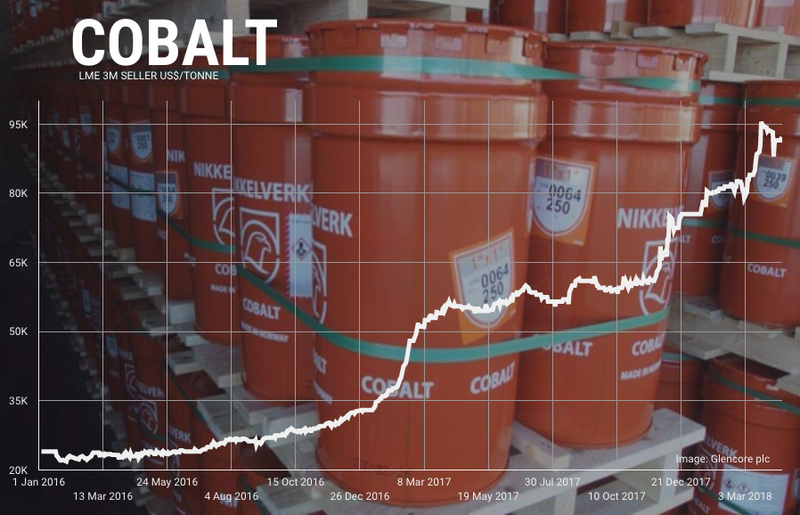 Cobalt has been drifting lower after hitting near 10-year peaks last month to exchange hands for $91,500 a tonne on the LME on Friday. Cobalt remains up more than 300% since hitting multi-year lows at the beginning of 2016 as demand for the metal, a crucial element in batteries used in cellphones and electric vehicles, spikes. While some of the froth has gone out of the spot market, the jostling among to secure long-term supply continues unabated. According to a Bloomberg report on Monday, Cobalt 27 Capital, owner of the world’s largest private stockpile of cobalt, said it is in talks for potential tie-ups with major Chinese companies seeking to secure supplies of the key metal in batteries powering electric vehicles. 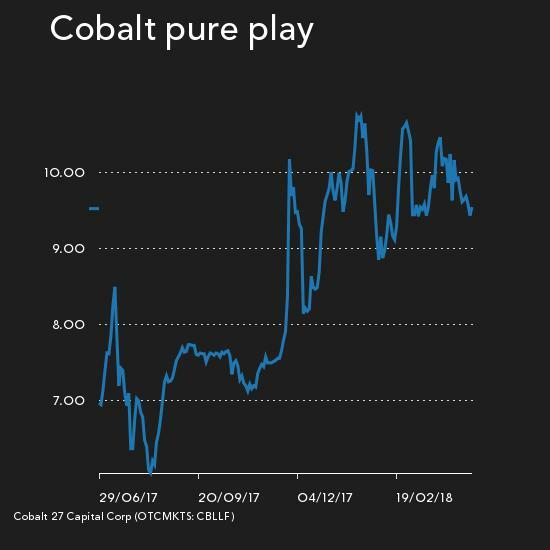 Cobalt 27 stockpiles the metal (around 3,000 tonnes), holds options on cobalt juniors and enters into streaming and royalty deals in an effort to be a pure play on the cobalt price. While the stock is well down from its March peak, investors who bought into the battery metals story when Cobalt 27 listed in June last year are now enjoying a 33% jump in the value of the stock. 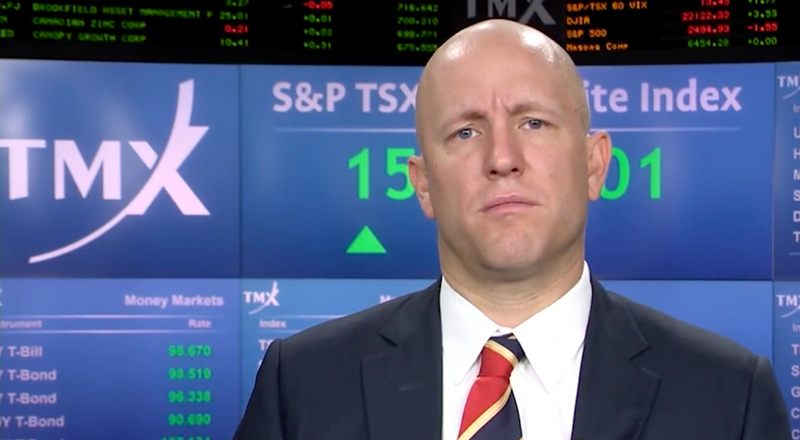 Cobalt 27 is weighing a dual stock listing in Shanghai or Hong Kong to expand its investor base, Milewski told Bloomberg, without giving a timing. The Asian nation is rapidly accelerating the development of low- or zero-emission vehicles, targeting 7 million sales on new-energy vehicles by 2025. Sales of battery-powered, plug-in hybrid and fuel-cell vehicles in China represent the largest global market, and could rise more than a fifth to surpass 1 million this year, according the estimates by the China Association of Automobile Manufacturers. The auto industry is "waking up too late" to the fact that China will hold most of the world's supply of battery raw material cobalt, Ivan Glasenberg, CEO of top producer of the metal Glencore, said in March. Annual production of the raw material is only around 100,000 tonnes primarily as a byproduct of nickel and copper mining. The Democratic Republic of the Congo today has six of the top 10 cobalt mines globally. Due primarily to Chinese investment, by 2022, the central African nation will host the nine largest cobalt producers. With ERG's $1 billion RTR operation comes on stream later this year and Glencore restarting its Katanga operations in the country will see the DRC's share of global production increase from around 60% to nearly three-quarters. Congo also holds half the world’s reserves. Not only is primary production highly concentrated, but the downstream industry is beginning to resemble a monopsony. China, despite having no cobalt resources of its own, is responsible for some 80% of the world’s cobalt chemical production, which overtook metal production around four years ago. Zhejiang Huayou Cobalt, the world's top cobalt refiner, increased output 35% last year and on its own was responsible for 20% of global output. The company sources nearly half its requirements from mines it owns in the DRC.